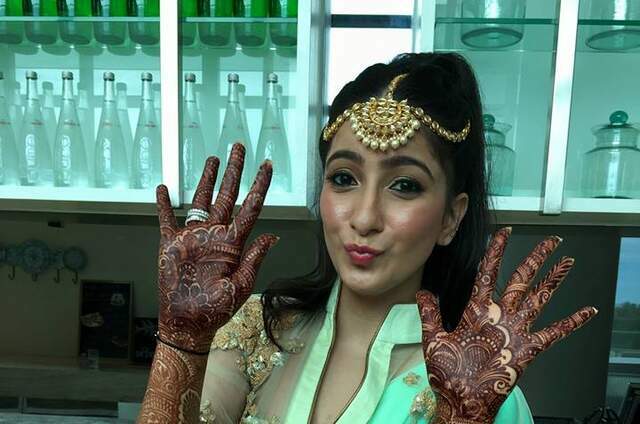 Bridal Mehendi with a Modern Twist. 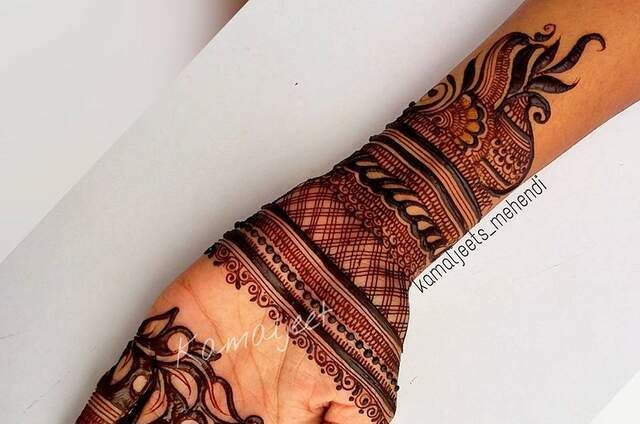 Lotus & Paisley Bridal Mehendi by Deepa. 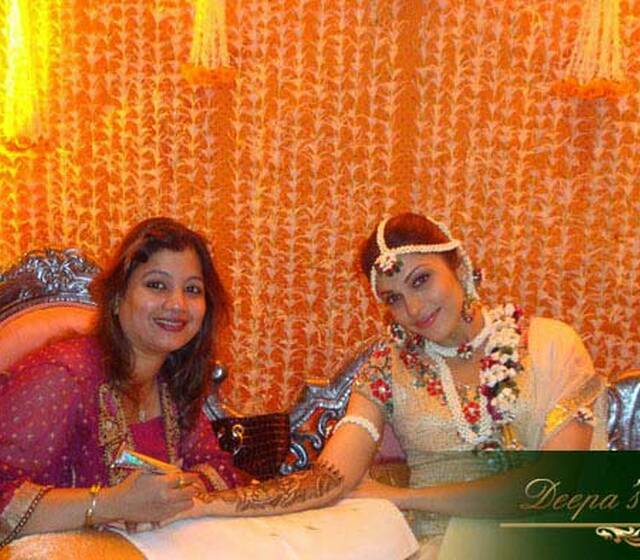 Deepa Sharma, India's foremost and one and only 3rd generation, celebrity mehendi designer. Deepa’s exclusive designs and 75 years of lineage in this field sets her apart from the rest. 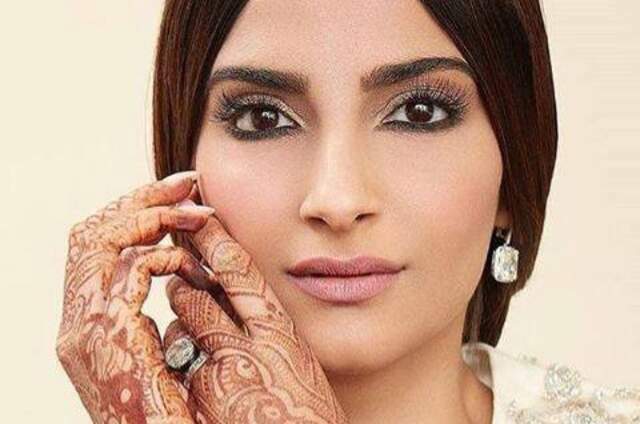 Deepa has earned accolades, as THE MEHENDI DESIGNER, whose bridal mehendi art was adorned on the world’s most beautiful woman’s hands at her wedding, Aishwarya Rai Bachhan. Deepa can paint your dreams on your palm. Deepa’s Bridal Mehendi art was showcased on the National award winning actress, Kangana Ranaut’s hands in the world famous movie Queen. Deepa has also made her presence felt on Zee Tv, Doordarshan, Midday, Divya Bhaskar, Cosmopolitan Magazine,Bombay Times, DNA, Le Defi Quotodien,Mauratius and many more. 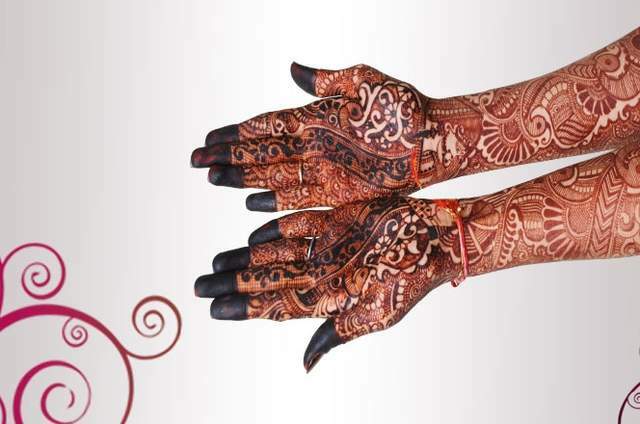 Deepa’s fame and intricate designs earns her regular invitation to many countries around the world for Bridal Mehendi/henna applications.To begin with, an experience of 75 years for Bridal Mehendi designing that has lived through three generations in her family from her maternal grand mom to her mom and now Deepa. 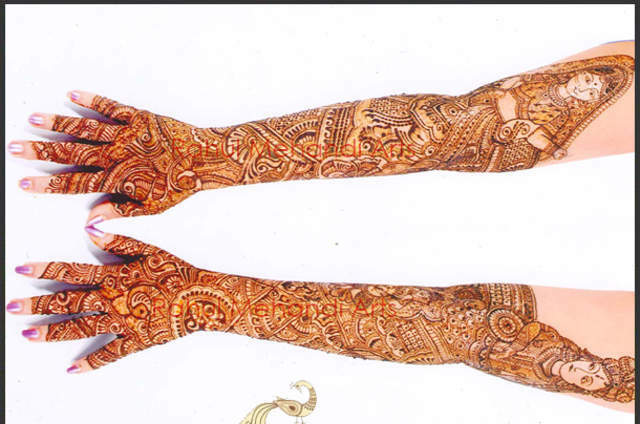 Deepa can proudly call her family as the “Legends in Mehendi Designing”. What was started by Smt. Ayodhyabai Sharma ( her maternal grand mom) was taken to new heights by Smt. Bhramadevi Sharma (her mom) and is now being given a new meaning by Deepa. 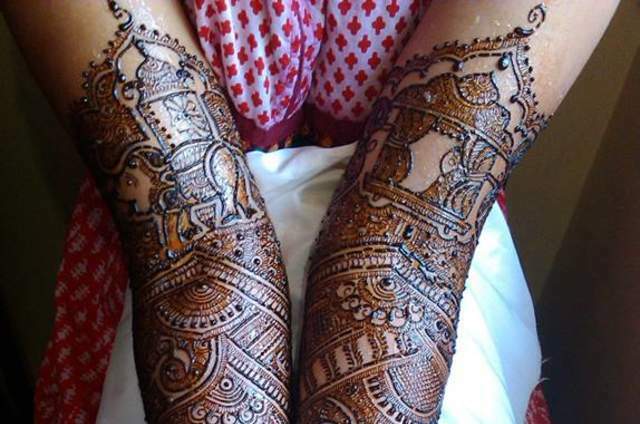 Being torch bearers of this traditional Indian art, mehendi designing is limitless for them. Deepa constantly adapts from her surroundings to give a creative meaning a beautiful visual. Deepa makes all your visions come to life in a truly artistic way. 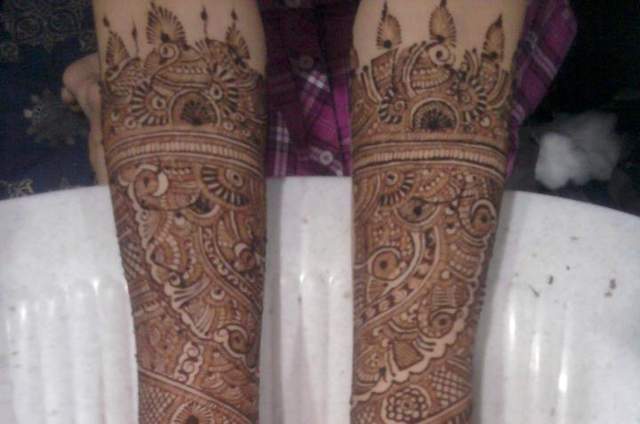 Deepa specialize in attractive Theme Mehendi, for all kinds of festivals and weddings. 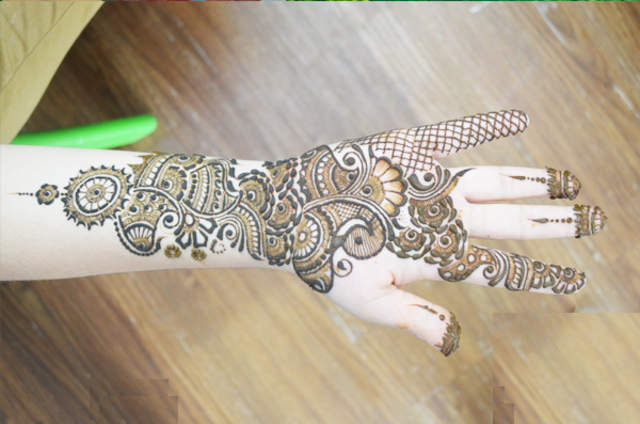 Some of the designs and themes that she specialize in includes Bridal Mehendi, Akhati, Rose, Floral, Lace Glove Mehendi, White mehendi, Glitter Mehendi, Jewelery Art mehendi, Heritage Art, Greek Theme Mehendi, Jadau, Kudan, Pallu-Bandhani, Shaded, Arabic, Swarowski, Coloured, Nail Polish, Block Print, Traditional Mehendi and Funky Party Mehendi A timeless tradition that has been moving forward for three generations has now incorporated modern Mehendi designs that Deepa will be delighted to create for you and for your special moments. Deepa promises to bring a joyous sparkle in your life with her designs that celebrate life and love in a truly rich and beautiful way.